It’s the 110th match up between the University of Texas and Oklahoma and one of DART’s biggest ridership days. Before you hop on a train, check out the information below. 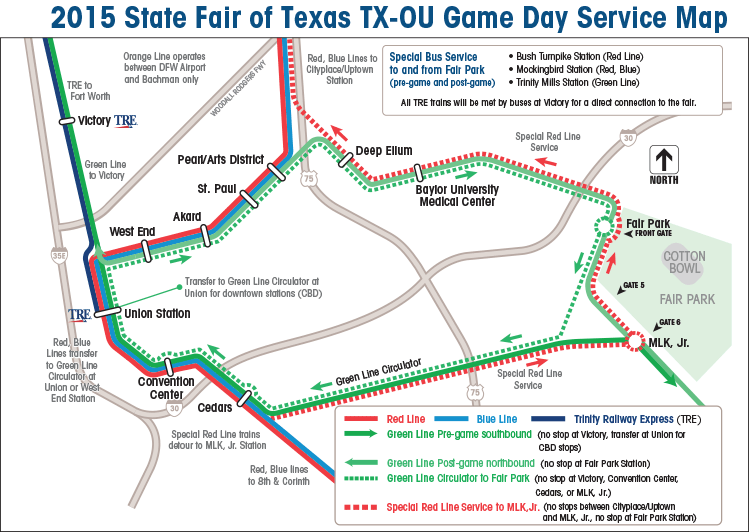 We run service a little differently to ensure everyone is able to get to Fair Park in time for the 11 a.m. kickoff. The fairgrounds are served by two stations — Fair Park, located on Parry Avenue at the main fair entrance, and MLK, Jr., located south of R.B. Cullum Boulevard and convenient to the Gate 6 entrance and the Cotton Bowl Stadium. Southbound Green Line trains will leave every 10 minutes from North Carrollton/Frankford Station for MLK, Jr. Station as early as four hours before the game. Prior to kick-off, these trains will not stop at Victory Station. In addition, these trains will not serve West End, Akard, St. Paul, Pearl/Arts District, Deep Ellum, Baylor and Fair Park stations. Transfer to the GreenLine circulator at Union Station to reach those stations. The special GreenLine circulator starts four hours before the game and operates six trips per hour. The circulator does not stop at Convention Center or Cedars stations and operates continually until approximately four hours after the game. Eastbound Orange Line passengers from DFW Airport and Irving’s five stations will transfer to the Green Line at Bachman Station. View DART Rail schedules effective Saturday, October 10. Customers are encouraged to take advantage of the early transit service, which on some lines begins up to four hours before game time. Trains typically begin filling more than two hours before kickoff. Passengers using special bus service from Bachman, Bush Turnpike, Mockingbird, Trinity Mills, Victory or Pearl/Arts District stations may have the best opportunity to avoid crowding on the Red and Green line trains. Departure time of the last TRE train to Fort Worth on Saturday: 11:11 p.m. from Victory Station. The last GreenLine train to connect to this train departs MLK, Jr. Station at 10:38 p.m. and Fair Park Station at 10:41 p.m.